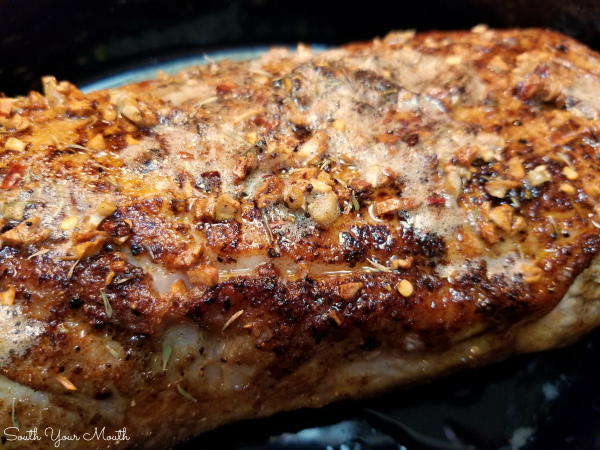 A fork-tender pork loin drenched in sizzling butter seasoned with Cajun spices cooked to crispy perfection in the crock pot. The “Mississippi-style” chuck roasts are all the rage right now. Ya know, the ones where you dump a packet of this and a package of that over a roast, slap a stick of butter on it, then arrange pepperoncini peppers around the top? 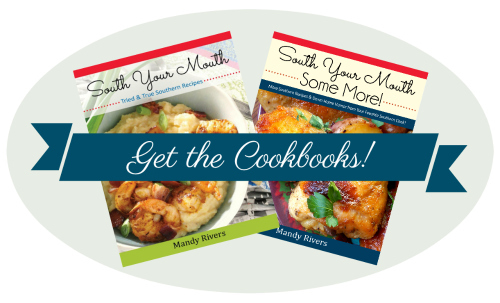 Don’t get me wrong, I’m not opposed to them – I love them too! But there are plenty of other, easy ways to season a roast without using so many prepackaged, preservative-packed ingredients. So, I thought I’d employ some of the same concepts of the “Mississippi-style” chuck roast but use a pork loin alongside that glorious butter and then use my own blend of seasonings. Boom. Too easy! Now, I do have to tell you this… my initial concept for this roast was to score it so the seasoned butter could really get down into the roast. Which I did. But then I saw a squirrel running across my backyard with a knitting needle (no, seriously, that happened) and got distracted and burnt the scored-side of the dang roast. I easily trimmed away with burned bits but then I had to flip it over to cook in the crock pot or y’all would take one look at the pictures and be like ummm, heifer, don’t quit your day job. Most pork loins (not tenderloins) have a fatty side. DEFINITELY score it and cook it, fat-side up in the crock pot so all that yummy butter gets down into your roast. And… did you look at this and think Ain’t no way that was cooked in a crock pot!? Those crispy edges and browned bits don’t look like something that was cooked in a slow cooker do they? Trust me, I know the internet is chocked full of recipes with bogus photos. But this is legit! All you have to do it take a few minutes to give your roast a good sear, coat the sucker in sizzling, seasoned butter, then cook it without additional liquid in the crock pot. This is what it looks like going into the crock pot! When we submerge a roast in liquid, the meat will ultimately boil in the crock pot which, as confusing as it seems, actually dries out the meat. This is an over-simplification but ultimately when we do that, the Law of Attraction kicks in and the moisture from the roast wants to go join the moisture in the cooking liquid. Which it does. Leaving the roast dry and bland. Plus, when it doesn’t get drowned in liquid, those crispy, browned parts stay that way! Holla! Oh em gee, I know I’m getting long-winded here but I have one more thing to tell you about this… IT WAS AMAZING. Like, I thought it would be good but I didn’t expect it to be this good. It is so moist and tender and the gravy? It’s like liquid gold! GOLD, I tell you!! And who else is excited about having a recipe for something different?! I’m so tired of my same-ole same-oles! AND it’s a slow cooker recipe! EVEN better! Mama and Daddy are under the weather right now so I made this to drop off at their house for them to eat for supper. Daddy called me later that evening to tell me how good it was. And y’all, that doesn’t happen too often. I’m not even sure if Daddy believes that I have published cookbooks or understands what the blog is, and he might think I made the whole Food Network show up… because he rarely ever says anything about my cooking other than the polite comments that you just say because you’re supposed to. Blot roast dry with paper towels then evenly coat with Cajun seasoning. If your loin has a fatty side, score the fat in a diamond pattern (if not, carry on…). Heat a large skillet over medium-high heat then add just enough oil to coat the bottom of the pan. Once pan is very hot, sear roast on all sides. Place roast in a crock pot (scored-side up if applicable). Pour off any excess oil from the skillet then reduce heat to medium. Add butter to skillet then stir with a wooden spoon to loosen up all the browned bits from searing the roast. Add garlic, thyme and pepper flakes to butter then sauté for 2 minutes. Pour the seasoned butter over the top of the roast. Cover then cook on High for 3-4 hours or Low for 5-6 hours. Remove roast from crock pot then cover with foil to keep warm while we make the gravy (this also gives the roast the necessary time to rest before we cut it). Pour all the juices from the crock pot into a small saucepan then heat over medium-high heat. Combine broth and cornstarch in a small bowl and stir well. Pour slurry into pan, add salt and pepper to taste, then heat until mixture starts to boil, stirring constantly. Cook for one minute then remove from heat. You could also do this in the crock pot (set to high), it just takes a little longer for the gravy to thicken. When ready to serve, slice roast then either place on a serving plate or return to the crock pot. Ladle a little gravy over the sliced pork to keep it moist then serve the remaining gravy as desired. 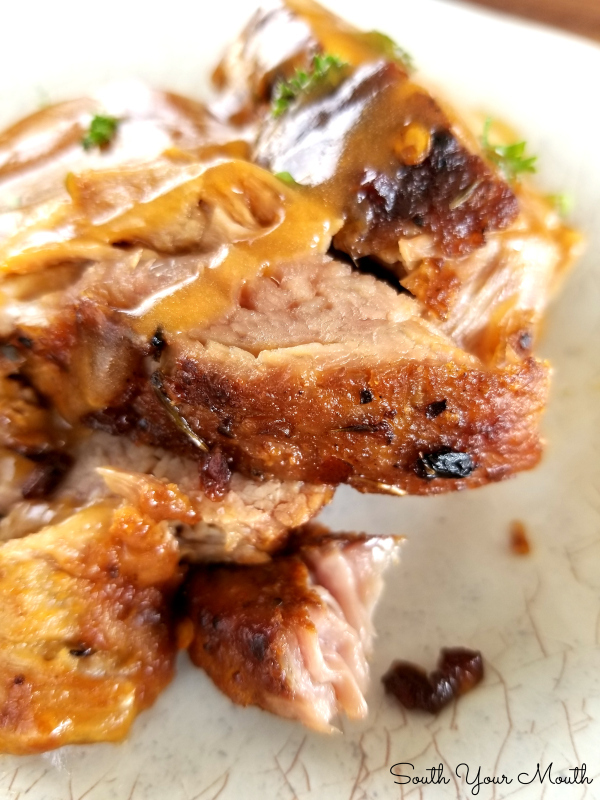 I used McCormick Cajun seasoning in this recipe but most any seasoning blends would work well (Montreal Steak, creole seasoning or your own blend). You can use 2 tenderloins in this recipe if desired but reduce the cooking time to 2-3 hours on High or 4-6 hours on low. Do not add additional liquid to the crock pot with the roast. 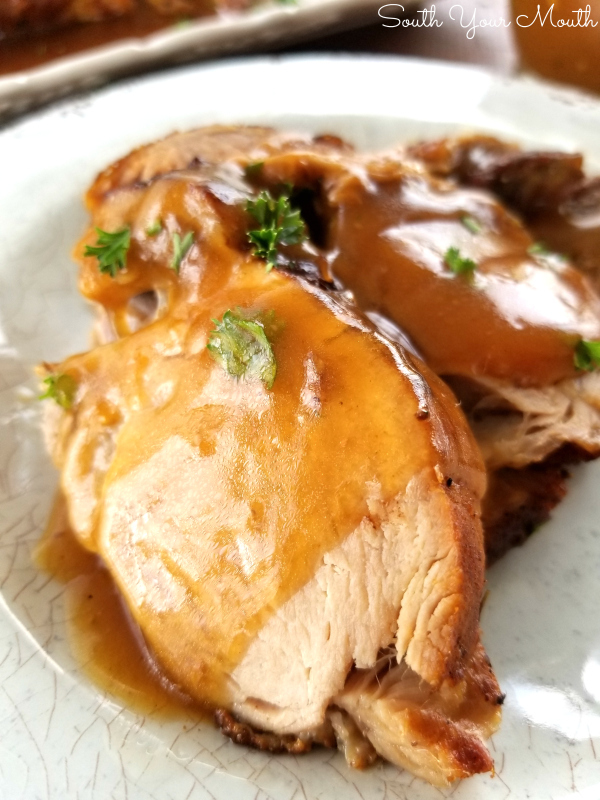 If you'd like to try a pork loin for the Instant Pot, try this recipe for Instant Pot Pork Roast with Vegetables! Okay, so I'm definitely saving this recipe to make at a later date (it looks delicious!! ), but I think we need to hear more about this squirrel incident... lol. LOL! Well, what had happened was... My GIGANTO 25-lb cat, Ricky Bobby, was chasing a squirrel through the yard who, evidently, managed to find some yarn somewhere that still had a needle dangling from it. But the way he had it, not only did he look like he was toting it, the yarn was wadded up and kind of looked like he had on a hat. I HAD to investigate! All I could think about was Braveheart... "They'll never take our freedom!!!" Hahahahahahaha!! I just knew that this story would not disappoint! Have a wonderful weekend, Mandy. This looks amazing! I cannot wait to fix it for my family. Thank you. Why reduce the cooking time when making two tenderloins? A 25 pound cat named Ricky Bobby chasing a squirrel carrying yarn and a knitting needle AND wearing a hat is sheer Hollywood movie material! Hysterical! 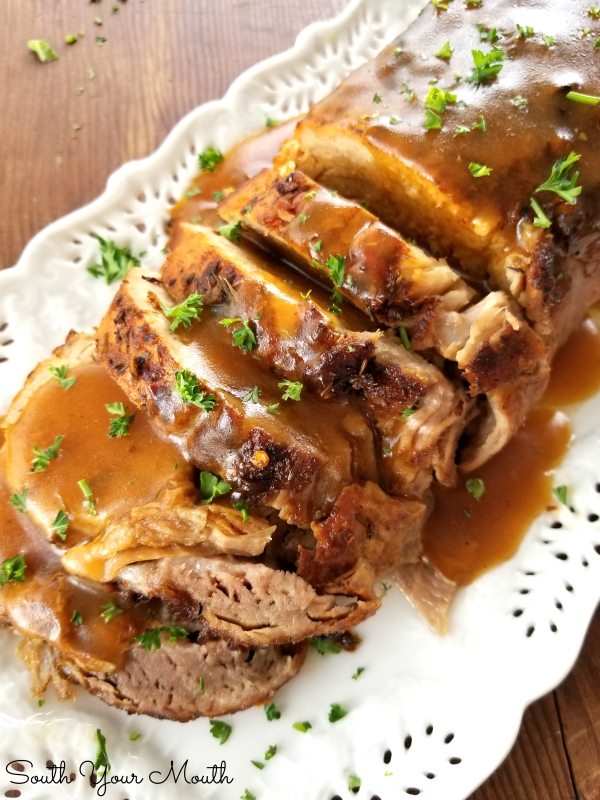 Not to mention the fact that pork roast looks absolutely delish! I am staying on this blog forever! Never a dull moment around here, that's for sure!! You just make yourself comfortable and stay as long as you like! 4to 6 hrs for lo right not 8 to 10. Just about made this same recipe last weekend, only difference was I put it in cast iron, low & slow, Old fashioned way. Yum yum & gravy was way good. Looks great Mandy! I'm dreaming about that gravy! this is in my crockpot now and it already looks yummy!! Thanks for this recipe. I will let you know how it turns out. Excited to try it!! I will be trying this as I have yet to find a way to cook a moist pork loin, curious that cooking for so long on high does it not dry out? I don't really want another fail of a tasteless Dried out pork loin. Is there a specific temperature or just cook it that long on high? Thank you. Excellent question! Typically crock pot recipes aren't for cooking something to the perfect temperature but more about slow-cooking it to be extra tender (usually falling apart, or close to it, in a good way). To ensure it's the best of both, cook it until it reaches 150 degrees (plus or minus 10 for safely pink or definitely done) then remove from the crock to rest. Thank you Mandy, will be trying this tomorrow. Our youngest daughters name is Mandy! I'm making this heavenly looking roast for Sunday dinner. I'm going to add whole baby red potatoes. I'll also serve roasted Brussels sprouts (separate pan, of course *giggle) Thank you for sharing this gorgeous recipe! plan on making this for Easter Sunday. I know you used this for a pork loin, but could you take this same recipe and use it for a chuck roast too? I have only cooked one roast in my life...so I'm new to all of this. Would the butter be too rich for the chuck roast? I know Kingston very well, our cottage was about 25 miles north. Kingston...great Pubs!!! I made this for dinner tonight and it turned out wonderful. Definitely on my make again list. Thank you for sharing this. Hi Mandy, what side dish/dishes would you serve with this recipe? The potatoes I mentioned above go great with this! Roast and loin are two different things. Which one do you use? 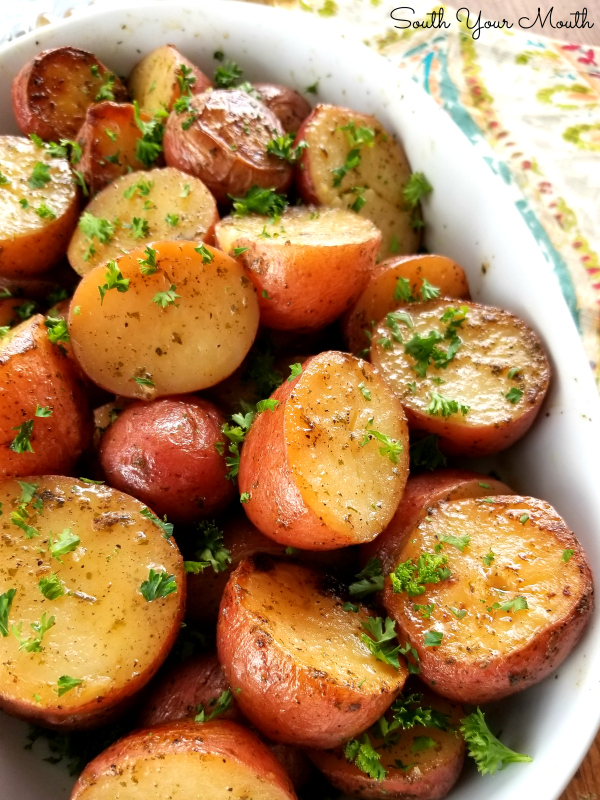 Could I add some petite potatoes to the crock pot with the loin or should I cook separately? I'm a noob at cooking but I'm excited to make this! 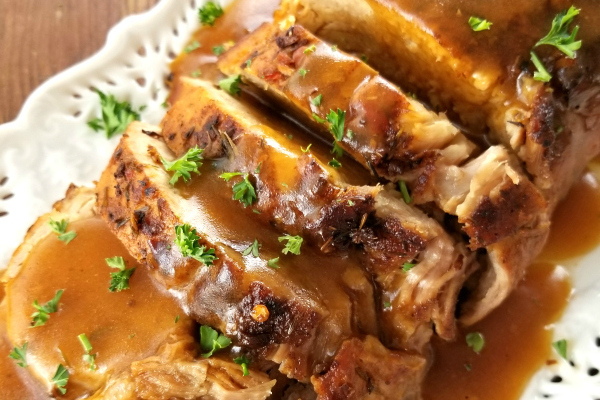 I made this recipe exactly as stated and my family loved it!! They were fighting over the left overs. Lol. They said it was one of the best meals I've ever made!! 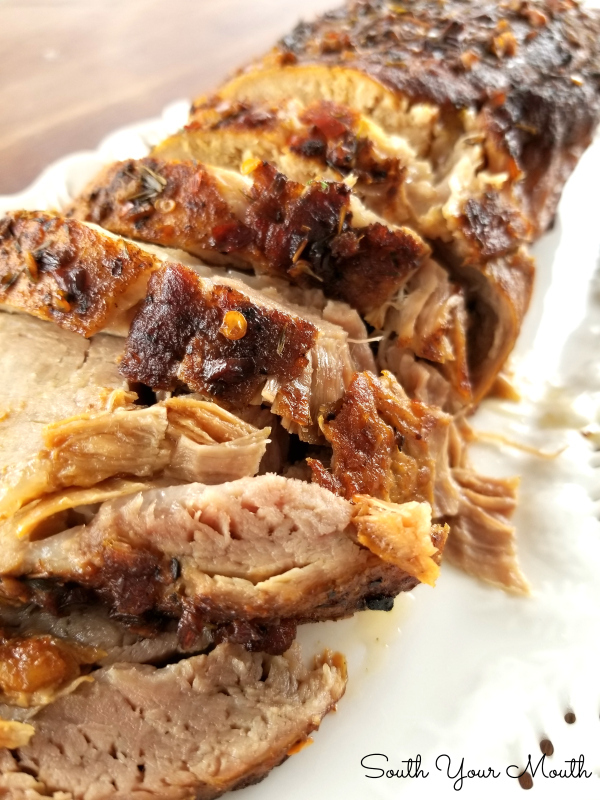 I've never have received so many praises on this pork roast for how juicy and tender it was. They loved it so much, they've asked for it again 2 weeks later!! Thank you so much for a terrific recipe!! Just put it in the crock pot....I'll let you know how it turns out in 3.5-4 hours. SNOWY day here in Chicago, nothing like some comfort food to warm ya up. The roast was sheer deliciousness and the gravy spot on. I only have one comment for other readers. I had a 3.98 lb pork loin. I cooked it for 3.5 hrs. My roast was little over done though no worries, the gravy fixed that. I have not used my crock pot in a while and remembered it seemed to cook at a higher temperature. I should have began to check the temperature of my meat at 2.5 hrs. The fault was mine. My husband kept saying if this thing tastes as good as it smells I'm in for a treat. He was and he enjoyed it. Thank you.